Karlheinz Stockhausen originally composed Tierkreis (‘Zodiac’), c. 1974–75, as a ‘tone-row suite’ for twelve music boxes. 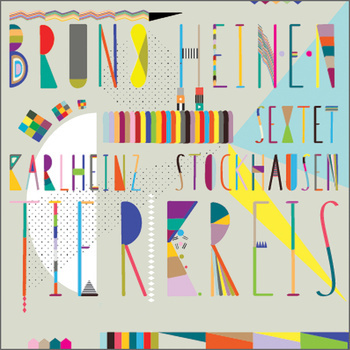 He subsequently produced scores for vocal, chamber and orchestral variations, but this reinterpretation by Bruno Heinen, undertaken with Stockhausen’s blessing, is the first for a jazz ensemble. Since Heinen had access to four of the 12 original Tierkreis music boxes, these have also been incorporated into the score. These belonged to his parents, a cellist and violinist who played with Stockhausen in the 70s when the piece was composed. Gifted a fifth, the “Aquarius” box, in December 2012, Heinen was also able to work this into the recording at the last moment. Though another of the music boxes introduces the album on “Aries”, the following “Taurus” goes jazzily, jauntily uptempo, developing similarly mechanical tropes with fluidic zest, and the ruminative “Gemini”, next up, is imbued with the coolly smouldering passion of a classic Wayne Shorter ballad. The Shorter influence is, generally, far more apparent than Stockhausen’s. Most overt in Tom Challenger’s tenor sax playing, it also finds its analog in Heinen’s compositional style. Fulvio Sigurta’s trumpet is notably deployed on an early brace of tracks on which Stockhausen falls entirely from memory. On “Cancer”, he brings boldness of definition to the mellifluous muscularity of classic Blue Note-style bop lines, before a drum solo burns off the frictional heat he’s generated. On the freer “Leo”, Sigurta counterpoints a bustling bass/drums tussle. The five pieces—”Taurus” thru “Leo”—which get the album proper underway all burn with all the sinuous clarity of Shorter’s latter-day modernist post-bop. They contrast nicely, both with six more painterly pieces in which the music boxes feature, and with a couple of beautifully realised solo features. “Sagittarius” is for contrabass solo; “Pisces” for the similarly vibrant, warm and woody textures of double-tracked bass clarinet. Other pieces match key soloists to music boxes: piano and trumpet embellish the “Virgo” melody; Jon Scott develops the percussive patterning of “Libra”. “Scorpio” then punches right back in to the jazz mainstem with emphatic rhythm, unison horns, and smouldering clarinet that’s emblematic of the sextet’s tightly corralled power. Still, the pieces that feature Stockhausen’s music boxes, and which dominate the latter half of the album are certainly the most delicately nuanced. On “Capricorn”, trumpet and bass clarinet twine sinuous anticipatory lines; Allsopp’s clarinet then at first shadows, then develops the music box melody. On “Aquarius”, a piano/music box duet, Heinen gently taps out an accompaniment on wood and damped keys. The album ends, as Stockhausen stipulated, as it begins, with the piece representing the star sign under which it was performed, which was “Aries”. On the opening version, Heinen elaborates brightly on the “Aries” music box’s luminous yet brittle melodies. On the closing version, piano and double bass essay still more fragile extrapolations. The Heinen sextet’s saxophonist, Tom Challenger, and drummer, Jon Scott, also play in the collective quartet Dice Factory, alongside pianist George Fogel and bassist Tom Farmer. This, their self-titled debut album was released last year. Featuring four compositions apiece from Challenger and Fogel, plus two more by Farmer, it’s a great set; less deliberate than Heinen’s thoughtful re-contextualisation of Stockhausen, its creativity seems more spontaneous, and a tad more vigorous; less textural and more pointillist. With more avant-garde than straight-edge jazz appeal, it’s perhaps a collection just as, if not more likely to satisfy curious Stockhausen fans. In other contexts, Challenger plays sax with both Heinen’s sextet and their Babel label-mates Outhouse. He also leads the elec. jazz ensemble MA, which also features Fogel. Meanwhile Tom Farmer is the double bassist for award-winning quartet Empirical, and Jon Scott is the drummer for Kairos 4tet. The quartet’s interactions are seemingly weightless but mercurial, their music evolving at typically brisk tempo, rich with incidental elaboration but brooking no superfluity. Chalenger’s “Pipes”, being a solemn, down-tempo number, is atypical of the whole. On most pieces, bustling chick/thump percussives charge a deft lyricism which the quartet collectively imparts to each composer’s work with a quickening jolt of aleatoric indeterminacy. Fogel is as nimble and assertive as Farmer, with Challenger and Scott beguilingly incisive in their reactions. Though the quartet’s collective identity is strong, characteristic details do emerge. Farmer’s “Eternal Sleep” is among the more lyrical pieces here, and Challenger’s “Gooch”, in particular, is terrifically idiosyncratic, with tuned percussion suggesting a splash of Harry Partch. Main set closer “T.N.G.”, though not a highlight, stands out for its structural contrast between downcast introduction and late surge of optimistic dynamism. This entry was posted in Album and tagged Babel, Bruno Heinen, Dice Factory, Jon Scott, Stockhausen, Tierkreis, Tom Challenger. Bookmark the permalink.